That Flag and a Pair of Historical Roller Skates - who is nicka smith? Hmm. The wheels of your brain are spinning. Everything “was all good just a week ago.” Then I had to come up in here and mix those good words above with historical society with Sons of the Confederate Veterans. 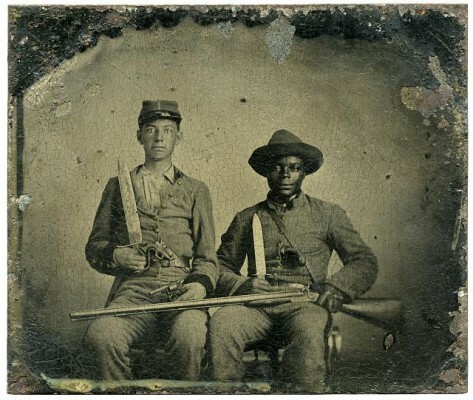 Sergeant A.M. Chandler of the 44th Mississippi Infantry Regiment, Co. F., and Silas Chandler, family slave, with Bowie knives, revolvers, pepper-box, shotgun, and canteen, circa 1861-1863. Source: Library of Congress. Take a Trip Next Door. To Your Neighbors House. I’m not talking about some random person. All the descriptors above are from the public website of South Carolina House member William “Bill” Chumley who openly said that the victims of the horrible Charleston church shooting could have prevented their deaths if they “defended themselves” and that they “waited to be shot.” Don’t believe me? Watch the video above or click here. The words came right out of his mouth. This is coming from the mouth of an elected official who represents a county that is more than 20% African American. But, he’s a son, father, teacher, little league coach…and a founder of a historical society and member of a lineage society. 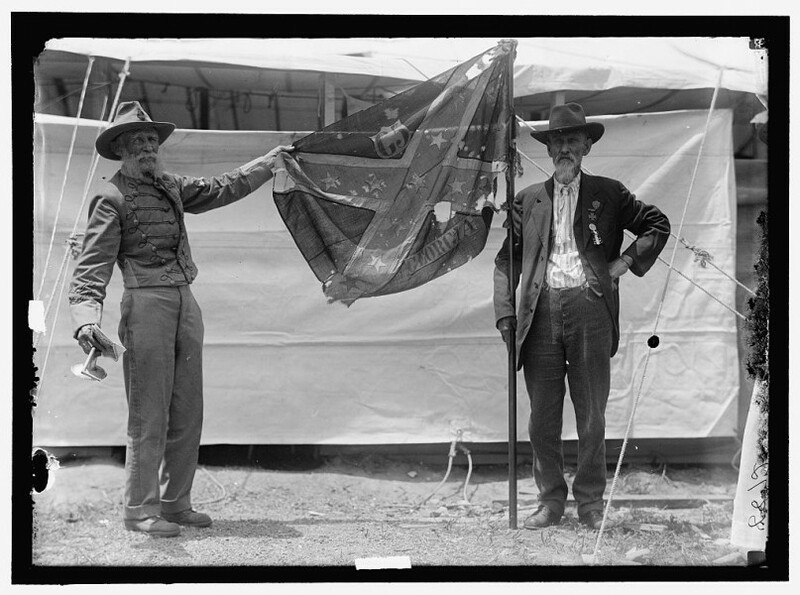 Confederate Reunion. 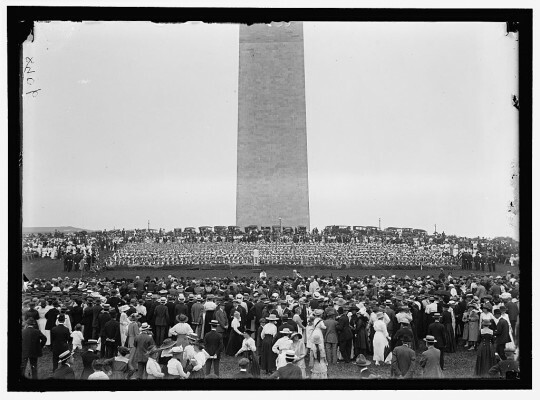 Human flag on monument grounds, 1917. Source: Library of Congress. Now, I didn’t post that video just to make you mad about the whole situation all over again. Mr. Bill’s already issued “an apology.” But, is he really sorry? We would hope that all of Mr. Bill’s experiences in life have guided his world view, but perhaps he suffers from a disease I call “innocent ignorance.” This is when someone knowingly makes a statement with their chest puffed out and then hides behind it later as if they had no idea what they were saying. Mr. Bill probably is a nice man. On the other hand, while his words definitely offended many, is he really on an island to himself when it comes to what he said? The truth is there could be many people who feel like him and operate like him sitting right next to us in society meetings, at conferences, etc. and we don’t even know. Let’s do one better. They could even be related to us knowingly or through discovery following a genealogical DNA test. What will you do, as a society member, officer, or board member when you witness someone like Mr. Bill take a stance regarding issues of race within your group that are not in accordance to the society’s mission, goals, and moral stance? Will you willingly challenge them or sit back and allow the “innocent ignorance” disease to become a plague in your group, eventually killing it off? Let’s take it a step further. What if you are a person of color and you’ve spent A LOT of your money and time building your family tree, but you hoard the information or you haven’t found a way to engage the younger generations of your family? Now, this sounds like a small problem on the surface, but it actually can be a MUCH larger issue. If you’re witholding the information you’ve learned willingly, you could be aiding and abetting another outbreak of “innocent ignorance” at the hands of a family member like Karen Cooper, an African American woman who is “proud” of the Confederate flag. Yes. She. Said. It. Wanna read more? Honestly, when I read those words and saw that video, the first thing I thought of was a blind African American man who was a member of the Klu Klux Klan and had no idea he was African American. Sound familiar? At first, I was willing to give Karen a pass because she was born and raised in New York and is a transplant to Virginia. LOL But then, I started thinking. Who in her family is to blame for her not being aware of African American history, especially her own? Did she come from folks who left the deep south, refused to talk about it, and now their younger generations are “innocently ignorant” towards how they came to be born and raised in the northern US? Or, perhaps she comes from folks who were free people of color, but someone at some point had to be enslaved…unwillingly. What Does This Have to Do With Genealogy? This means that the potential bigot sitting beside you at your society meeting, a conference, workshop, etc. can’t afford to be a bigot anymore. This means that there is a high likelihood that you’ll have to step out of your comfortable little box when it comes to doing research on the ancestry of your younger family members – they are likely going to be multiracial, so you’ll need to be well versed, in a plethora of different research types, period. The future “they were talking about” is now. (1) Holley, Peter. “Why This Black Defender of the Confederate Flag Says Slavery Was ‘a Choice’.” Washington Post. The Washington Post, 30 June 2015. Web. 30 June 2015. <http://www.washingtonpost.com/news/morning-mix/wp/2015/06/30/why-some-black-defenders-of-the-confederate-flag-believe-slavery-was-a-choice/>. (2) “Millennials Outnumber Baby Boomers and Are Far More Diverse.”Millennials Outnumber Baby Boomers and Are Far More Diverse. US Census Bureau, 25 June 2015. Web. 30 June 2015. <http://census.gov/newsroom/press-releases/2015/cb15-113.html>.